At a time when the state is reeling under severe agrarian crisis, the Shivraj Singh Chauhan govt. is making a mockery of the farmers' struggles by accepting this award. 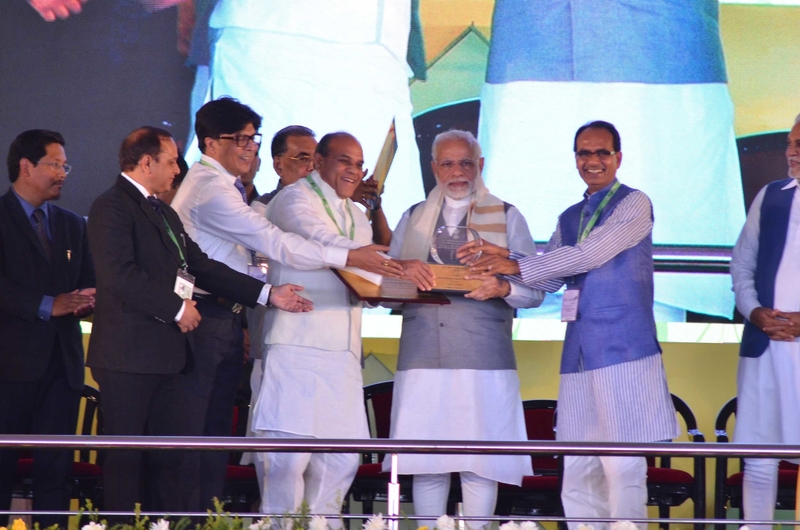 On March 17, 2018, Prime Minister Narendra Modi awarded Madhya Pradesh Chief Minister Shivraj Singh Chouhan and State Agriculture Minister Gauri Shankar Bisen with Krishi Karman Award 2016 for the best crop production in the country. This is the fifth award in a row for the state. However, this award almost makes a mockery out of the farmer deaths and their pathetic condition in the state. Between 2001 to 2015, according to National Crime Record Bureau (NCRB) report, 18,001 farmers have committed suicide in the state. While in 2016, according to the State Assembly Record, from February 1 to mid-November, 1,695 farmers had committed suicide. After adding, the total stands at a shocking 19,696 suicides in the last 16 years, which takes the average to three farmers suicides every day. If reports are to be believed, the reasons for the suicides are mostly crop failure, inability to sell their agricultural produce, inability to repay loans, as well as other factors like poverty, property disputes, family problems and illness. In addition to that, ‘bankruptcy and indebtedness’ are the major reasons for farmers’ suicide. According to agricultural minister GS Bisen, in 2015-16, the state had produced, more than 180 lakh metric tonne, while in 2016-17 the production reported a huge jump and reported around 215 lakh metric tonne. But incidentally, farmer suicides saw a 21% jump between 2013 and 2016, and in 2016, a farmer committed suicide every eight hours in the state.The latest figures on accidental deaths and suicides in India (ADSI), released by the NCRB, state that Madhya Pradesh alone accounted for 1,290 out of the 8,007 suicides by farmers and agricultural labourers across India, one of the highest in the country. As a result, scores of farmers’ protest have been carried out in the state in the last couple of years due to the government’s apathy towards agriculture sector. They have been demanding a hike in the Maximum Support Price [MSP], implementation of the recommendations of the Swaminathan Committee and more. MS Swaminathan, an agricultural scientist, had released a report back in 2006, recommending that the MSP for crops should be at least 50 percent more than their cost of production. The infamous Mandsaur farmers’ protest has not faded away from our memory. It is enough to showcase the ailing condition of farmers’ in the state. In June 2017, during the Mandsaur farmers’ protest, six farmers were killed by the police when they were demonstrating for a fair price of their crops. Its flames burned the entire state and put the Shivraj Singh Chouhan government on its toes. Citing the ‘Krishi Karman Award’ of Madhya Pradesh government as ‘economic magician award’, Congress MP and perhaps the Chief Ministerial face of Congress in the state, Jyotiraditya Scindia, came down heavily on the state government and said Shivraj Singh Chouhan government is making a mockery of farmers by receiving such an award. While speaking to the NewsClick he said that Krishi Karman is nothing but data management - the growth of the state’s farm sector is only on papers. It is based on reports prepared by officials behind the closed doors. “There are intermediaries from neighbouring states who collude with officials and illegally sell their crops here. In many instances, the produce lying in warehouses from last year re-sent to the Mandis and procurement centres and count as ‘new production’. The reality is ugly,” he asserted. Madhya Pradesh claimed to have registered an 18-20 percent growth in agriculture production and bagged Krishi Karman Award fifth time in a row [can we delete this? is being repeated a lot]. Scindia said that if these reports are real, then why have 21,000 farmers committed suicides during the past 13 years and why have the migration from rural areas of state continued unabated. “What else explains a situation of Madhya Pradesh is receiving this award, while in reality, farmers are reeling under debt, rising crop input costs (seed, fertiliser, pesticide, water, electricity), falling prices for crops, unfavourable weather conditions (hailstorm), pest damage, low or no insurance payout,” he said. “At a time when farmers are throwing their crops on the streets for lack of a fair price, how can the CM accept this award? Is it not an insult to the state’s farmers who have been driven to commit suicide in the last few years? Has the CM already forgotten the Mandsaur shootout where the state police shot six farmers who were protesting and demanding a fair price for their produce?” Scindia added. Countering Scindia, Agriculture Minister of the state, Gauri Shankar Bisen gave a strange reply and said that 70% to 72% of state’s population depends on agriculture and farmers’ committing suicide is nothing new. They are taking this extreme step not only because of debt and crop failure but for other reasons too. “Farmers’ are committing suicide because of other reasons, they are human begins too. If anyone who is associated with farming dies, people called them farmers and say that the farmers have died. Those who are levelling allegations of data manipulation, I must say they are all baseless,” Bisen said. He also added that Prime Minister Narendra Modi has appreciated their work and also showered praises on the Bhavantar Scheme. The state government had introduced the Bhavantar Scheme in October 2017, four months after the farmer unrest claimed six lives. The scheme aimed to pay farmers the difference between MSP and marketing prices. Former state minister and Congress MLA, Mukesh Nayak has also raised questions about the authenticity of the reports. In this episode of NewsChakra, senior journalist Abhisar Sharma talks about Prime Minister Modi’s narcissism.